We are located on the island of Conch Key, mile marker 63, just past the Long Key Bridge. This bridge is approximately 2.4 miles. You will find the mile markers (small green signs) along the side of US 1. Key Largo is mile marker 120 and Key West is mile marker 0. Conch Key is on the bayside of U.S. 1. Miami International Airport is approximately 2 hours north by car to Conch Key. Ft. Lauderdale is 2 hours 30 minutes north of Conch Key. Key West Airport is 1 hour 15 minutes south of Conch Key. Add 12.5% for Florida Dept. of Revenue and Monroe County Local Sales Taxes. Note: Any major holiday add $200.00 per week: Christmas week; New Year’s week; President’s week; Easter week; Memorial Day; 4th of July week; Thanksgiving week. 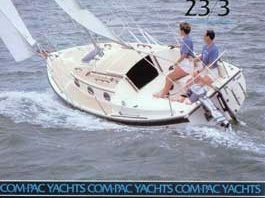 There are no other extra charges unless we find a need to charge a fee for damage or abuse to our rental units or sailboats. All bookings are a minimum of one week. However, we will consider a 3 night minimum during our summer season. A $500.00 deposit, which is separate from the rental fee, will confirm your reservation and will be held as security for the rental unit and boat. All final reservations are required to be made by telephone. We will hold your reservation for a week until we receive your security deposit. The full amount is due 60 days prior to your arrival and may be paid by personal check, cashiers check or money order. Sorry, we do not accept credit cards. Confirmation and directions will be sent after receipt of the $500.00 deposit. Upon receiving your deposit, we will also forward to you a small guidebook to the Florida Keys that you may keep as a souvenir of your islands once held, and of a vacation in the Florida Keys that was unique in every way! If you wish to cancel your reservation (for any reason whatsoever) just notify us of this decision in writing. Our refund policy: If you notify us 60 days or more before your stay was to begin, we will refund in full all monies paid to us. Or if you notify us of cancellation within 59 days before your stay was to begin and if another guest reserves the house and boat for the same period, we will refund in full all monies paid to us. But, if we are unable to obtain another guest for this period, we retain the full amount for the period of your intended stay. If a hurricane is imminent, you have the option of either a full refund or rescheduling your time with us. House check-in time is after 4 PM on Saturday. House check-out time is before 10 AM on the Saturday following. Treetop Cottage check-in time is after 4 PM on Saturday. Treetop Cottage check-out time is before 10:00 AM on the Saturday following. Advanced notice of your intended arrival time is greatly appreciated. Because it’s easy to get too much sun, be sure to bring sun screen, Our Florida Keys Sunseta wide brim hat, long sleeve shirt or blouse and possibly full length trousers or slacks, but don’t forget that bathing suit! Our average air temperature in the Florida Keys is approximately 75° during the winter months. The average water temperature during the winter is between 65° – 68°. 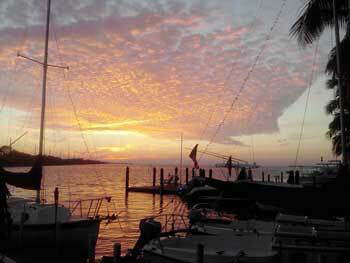 The atmosphere in the Keys is informal and friendly. Anything formal (coats and ties) are never required nor expected. A Keys winter sojourn, the perfect cure for the winter blahs. If fishing is your hobby, we have a list of Florida Keys fishing guides. If you would like to take a day and go fishing with an expert guide – one of our neighbors on Conch Key is very friendly and professional. You can contact Capt. Dan directly at www.sharkrivercharters.com. He has two homes in Florida but is on Conch Key most of the time. 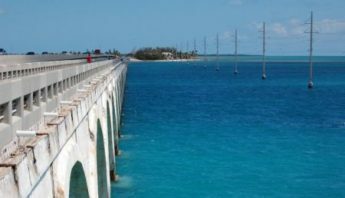 If you are a walking or running enthusiast, the Long Key bridge is a sure way to stay in shape while watching yet another warm sunset in the fabulous Florida Keys. We also have bicycles and kayaks for you to use. Many fine restaurants are minutes away, with a flare for our native seafood. 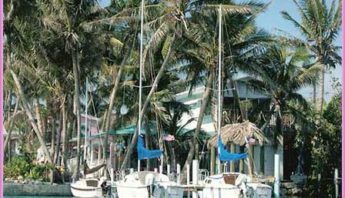 Tiki bars are along the way, where you can sip some of the most well known island drinks, the best of the Florida Keys. A great place to go is Long Key State Park. Located on the ocean side, this park has a beach with picnic tables and BBQ’s. Nature trails are abundant with many Keys and Everglades wildlife. Canoes are available in the park for an oceanside mangrove water adventure. Another great beach is in Marathon at Sombrero Beach. Less than 2 miles from Conch Key is Hawk’s Cay Resort where you will find power boat rentals, sport fishing boats and dive charter boats, windsurfing, jet skis, parasailing and a glass bottom boat tour. Be sure to enjoy a tour of the Dolphin Research Center, which has several interaction packages available – www.dolphins.org. This facility is approximately 5 miles from Conch Key. We will make sure you have a fun time in the Florida Keys!